“How would you reconstruct a culture that works for all beings?” We are asked to participate in creating an ecstatic culture preserving the ancient wisdom in a way that works with nature. 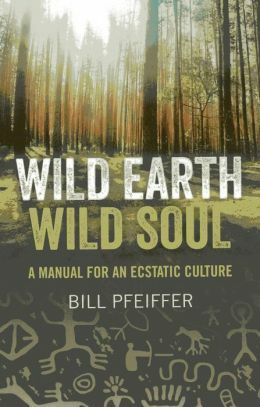 Bill Pfeiffer’s Wild Earth, Wild Soul: A Manual for an Ecstatic Culture looks at why a new culture is needed and how we can arrive there. This is a how-to manual based on the experiences of many people who have participated in a Wild Earth Intensive, including those who have been guest mentors and facilitators. And in the valleys, people as strong and varied as the land. Bill spent many years with Native Americans and Native Siberians observing their culture. The Wild Earth Intensive is a ten day workshop that both serves as a reminder of the practices of our ancestors, and allows us to experience for ourselves, in small groups, those practices brought into contemporary life. We are invited to lead such a workshop with complete instructions. “How to Use This Book” is introduced early. Concepts are explained for the guides and facilitators. Each activity has a clear explanation of its purpose. Ways to be a good leader are shown with the role to allow each participant’s true nature to come forth. Help people get where they want to go. The strengths of Wild Earth, Wild Soul includes a conversational style where you feel like you are in the room with the author. The book stays focused on the theme of “a spiritual ecology in sync with the universe,” and gives specifics on how to carry out an intensive. As I read this book, I felt that not all are ready to be Eco-spiritual activists. But for those who desire to be removed from the separation between “out there” and “in here,” a Wild Earth Intensive allows us to explore this through a direct experience with nature and in community. The author suggests that the reader can skip the chapter, “A Spiritual Permaculture,” and still participate in an Intensive. I feel this material is important for a deeper understanding of the WEI principles and the activities during the Intensive. A grasp of the subtitle, A Manual for an Ecstatic Culture, comes from this chapter. We discover Ecstasy is a symbol of oneness – a tribe, a community – with love as the key. Further chapters “help our soul merge with the divine mystery,” give us tools to listen and exercises to connect to the natural world with knowledge and awareness of place. The power of story is discerned. A worldview of Takers and Leavers is clearly explained, which forms the basis for desiring to bring change from a Takers to a Leavers world. Ceremony is an important aspect of a WEI experience. The author makes Shamanic Journeying feel safe. Other things taught in this book include Play and Stillness. There is an invitation to bring in Elders and Mentors as part of an Intensive and explains why they are important in our lives. I found the interview to be long, but some valuable information was shared. The importance of Art and Music is explained. Our ancestors tapped into primordial vibrations through music and art and we can do so now. The title Wild Earth, Wild Soul expresses well what is needed to create a new way for society to see and the book gives practical ways to get there. I already ordered one of the resources and the book made me think and affirmed my own journey. Other books I have read that released creativity and a connection with the earth include: The Artist’s Rule by Christine Valters Paintner, The Soul’s Palette, Cathy A Malchiodi, Drawing Closer to Nature by Peter London, and Freeing the Creative Spirit by Adriana Diaz. Hi Cindy: I did a random search for my book and alas your review came up. Wonderful! It’s always so satisfying to know when a reader has really understood what I spent a lot of time trying to convey. That said, thank you! I hope our paths cross in 3D one day.